Spotlight: Chin Up! There Are Still Hidden Gems in the Crypto World! 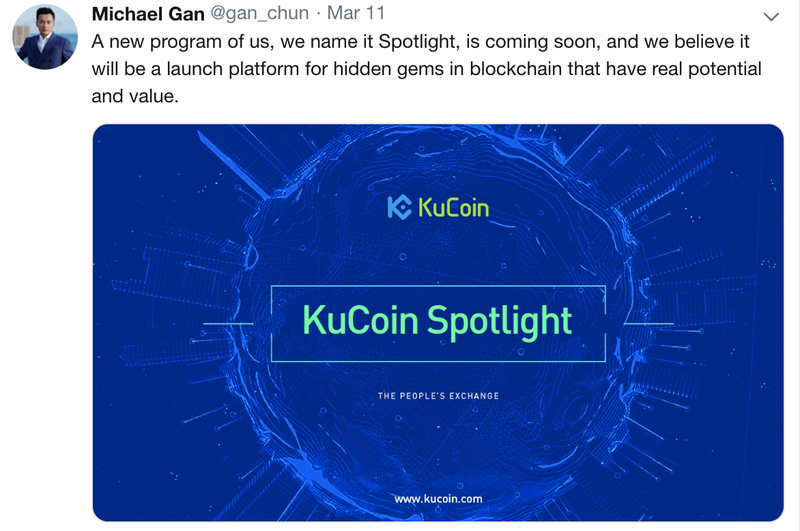 To start, this is an advertorial of KuCoin’s new project launching program ‘Spotlight’. Yes, I am not trying to trick you — no hugger-mugger at all. Why would an exchange invest a huge amount of resources — time, manpower and money — into a brand-new product in such a dull market? For good reasons, obviously. Let me elaborate, step by step. For those who don’t have much time to scrutinize the whole article, I promise to highlight the keywords. But come on, it won’t be longer than 500 words after all. As our CEO Michael Gan’s latest Tweet read, it is a platform for “hidden gems in blockchain with great potential and value” to display themselves to a mass audience from close range and win their hearts (and financial aids) for further expansion. Very straightforward. Just think about the counterpart risk. Bring the time back to early last year, when we all saw ICOs mushrooming — good projects and malicious ones — thanks to an irrational sentiment of the whole market, believing only in upward momentum. How many of you guys were NOT punished by reckless investments in, what turned out to be, unreliable projects back then? Sorry, I mean speculation. Or maybe I should say gambling. Nowadays, programs like Spotlight shoulder the whole platforms’ reputation that not a single decent exchange would want to risk. “My good opinion once lost is lost forever.” — Quoting Mr. Darcy in ‘Pride and Prejudice’ of Jane Austen. The value is integrity. Stick to it, period. However, to carry it out is another issue, a sounds-simple but difficult-to-implement one. That is, to screen out the “hidden gems”. There are no so-called sunset industries, the sun is just set for certain enterprises. Similarly, in the blockchain world for starters, it is now universally conceded that the technology itself is meant to boom. Secondly, there are “hidden gems” across almost every vertical. Here are some that I’d like to share with you guys. Public chain. Without much exaggeration, public chains shoulder the prospect of blockchain. Just take a quick glance over Bitcoin, Ethereum, Litecoin, NEO and EOS, among others. It is indisputably the origin of the technology. Privacy-related solution. I’ve heard several friends emphasize the importance of data in the ongoing internet revolution. Some have called it ‘the fuel’, others called it ‘the blood’. Regardless of the dramatic wordings, we are definitely expecting a trillion-dollar data market. Everyone sees the opportunity, including the data hubs — I’d be very surprised if internet giants such as Alibaba weren’t aware — and the true data owners, the end-users, who are increasingly conscious of protecting their privacy. Other infrastructure technology. Highlighting these three sectors doesn’t mean we don’t look at others. Our list goes on and on. It’s just that we have seen a lot of such tech-heavy projects that were run by a bunch of geeks who may be too concentrated on coding to execute some reasonable promotion. Some of these projects are still struggling to survive, while some have had to give up. Such teams deserve proper financial aids to grow as, at the end of the day, they may significantly contribute to the blockchain evolution eventually. We are strongly convinced that it’s a meaningful move and, together with our respectful peers, we’ll become a major driven power to a fast-growing cutting-edge technology. End of the advertorial. Oops, sorry about the extra 100-ish words. Btw, KuCoin is on Twitter @kucoincom, and Michael is @gan_chun, while I myself is @lyu_johnny, come and speak with us! KuCoin Co-founder & VP, doubles the partner of KuCoin’s investment affiliate Phoenix Global Capital, blockchain frontrunner, investor and advisor. KuCoin aims at providing users digital asset transaction and exchange services which are even more safe and convenient, integrating premium assets worldwide, and constructing state of the art transaction platform.